Well it has been a while since I posted and a lot has happened. First we had Christmas. I spent mine in Canberra with my family. This year was my first year without my daughters and it hurt. I missed them so, so much, but it is only fair we alternate years. I was shocked with the gifts I received and look forward to going down next week with my kids for them to give presents to their grandparents. My parents got me an amazing iron. I have never had an iron worth more than $10 or $20 and they were always crap in comparison to mums. Mum got me what she thought was a $40 one, which turned out to be a $70 fantastic one! My parents don't do gift cards. Mum will never give them, but to my absolute amazement I got one this year (I have had the most shocking year). I nearly fell over. Even better was when I went to use it and one of my favourite stores was on sale. Usually a dress there costs me $140, but I got 2 for $70, leaving money still on my gift card for later! 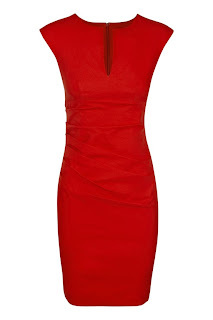 This is the next dress I will be getting with some of the giftcard money and paying the difference. New Years Eve I had my kids and boy did we party! They crashed out at 9pm and I watched the Dark Knight and worked. Woo hoo! I'm exciting. The last 3 months of 2012 were extremely intense for me and some of the scariest of my life. I am grateful I have gotten through it and so far the New Year has been amazing and I look forward to a prosperous and happy 2013.